Below you can view all the homes for sale in the Royal Oaks subdivision located in Charlotte North Carolina. Listings in Royal Oaks are updated daily from data we receive from the Charlotte multiple listing service. To learn more about any of these homes or to receive custom notifications when a new property is listed for sale in Royal Oaks, give us a call at 704 604 8836. Beautiful Restored 1940's Vintage Home, Quick Access to University, Concord Mills Mall, and Uptown Charlotte, Freshly Painted and Hardwood Floors, Family Room, Two Bedrooms, Updated Bath with Tile Floors and Tub Surround and Vanity cabinet and sink, Updated Kitchen Includes All New Stainless Appliances, Counter tops, Sink and Faucet, Beautiful Marbled Porcelain Tile, Numerous Recessed Canister Lights, Dining Area, Laundry Room, New Gas Furnace and AC system, Wooded Lot with Fenced Rear Yard. Showings available March 1ST. MLS#3477638. Ware Properties & Com. 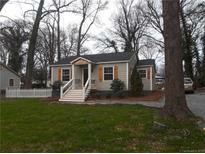 Inv..
Close to 485, Carowinds, Shopping and 20 minutes to uptown. MLS#3473207. Showcase Realty LLC. This is a great home for a primary residence or a rental property. MLS#3461771. CD Realty.